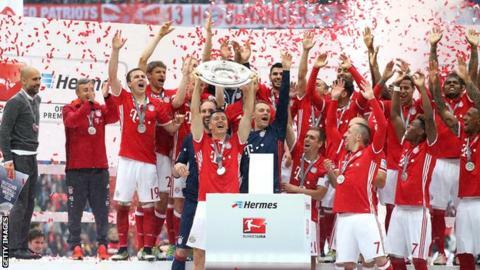 Robert Lewandowski became the first man for 39 years to score 30 Bundesliga goals in a season as champions Bayern Munich beat Hannover in Pep Guardiola's final league game in charge. Lewandowski's deflected shot wrong-footed Ron-Robert Zieler for the opener before Mario Gotze chipped home the second, and whipped in the third. Artur Sobiech scored Hannover's consolation at the Allianz Arena. Bayern finish the season 10 points clear of Borussia Dortmund in second. Bayern's French winger Kingsley Coman hit the post with a header, while Iver Fossum, Waldemar Anton and Edgar Prib missed good chances for Hannover. Before the game, there was a presentation to Bayern boss Guardiola, who takes over at Manchester City next season. His final Bayern game will be the German Cup final against Dortmund next Saturday (19:00 BST) as he aims for a second domestic double in three seasons. Match ends, FC Bayern München 3, Hannover 96 1. Second Half ends, FC Bayern München 3, Hannover 96 1. Corner, FC Bayern München. Conceded by Ron-Robert Zieler. Attempt saved. Arturo Vidal (FC Bayern München) left footed shot from the centre of the box is saved in the bottom left corner. Assisted by Franck Ribéry. Corner, FC Bayern München. Conceded by Salif Sané. Attempt blocked. Sebastian Rode (FC Bayern München) left footed shot from the centre of the box is blocked. Assisted by Franck Ribéry. Attempt missed. Robert Lewandowski (FC Bayern München) right footed shot from outside the box is close, but misses to the left. Assisted by Franck Ribéry. Corner, FC Bayern München. Conceded by Tim Dierßen. Attempt saved. Franck Ribéry (FC Bayern München) left footed shot from the left side of the box is saved in the bottom left corner. Attempt saved. Mario Götze (FC Bayern München) right footed shot from the right side of the box is saved in the bottom right corner. Assisted by Thiago Alcántara. Foul by Manuel Schmiedebach (Hannover 96). Delay in match Manuel Schmiedebach (Hannover 96) because of an injury. Attempt missed. Salif Sané (Hannover 96) header from the left side of the box is close, but misses the top left corner. Assisted by Miiko Albornoz with a cross following a corner. Substitution, FC Bayern München. Sebastian Rode replaces Jérôme Boateng. Corner, Hannover 96. Conceded by Medhi Benatia. Foul by Artur Sobiech (Hannover 96). Attempt missed. Franck Ribéry (FC Bayern München) right footed shot from the left side of the box is close, but misses to the right. Assisted by Robert Lewandowski. Attempt saved. Philipp Lahm (FC Bayern München) right footed shot from outside the box is saved in the top centre of the goal. Assisted by Thiago Alcántara. Attempt missed. Ceyhun Gülselam (Hannover 96) right footed shot from more than 35 yards is close, but misses the top right corner. Assisted by Manuel Schmiedebach. Substitution, Hannover 96. Tim Dierßen replaces Felix Klaus. Foul by Iver Fossum (Hannover 96). Attempt missed. Ceyhun Gülselam (Hannover 96) right footed shot from more than 35 yards is close, but misses to the left. Assisted by Manuel Schmiedebach. Attempt missed. Edgar Prib (Hannover 96) header from the centre of the box misses to the right. Attempt saved. Edgar Prib (Hannover 96) right footed shot from outside the box is saved in the centre of the goal. Goal! FC Bayern München 3, Hannover 96 1. Artur Sobiech (Hannover 96) right footed shot from the centre of the box to the bottom right corner. Assisted by Ceyhun Gülselam. Attempt missed. Iver Fossum (Hannover 96) header from the centre of the box misses to the right. Assisted by Felix Klaus with a cross following a corner. Corner, Hannover 96. Conceded by Jérôme Boateng.